Despite now being an avid fan and having logged over 300 collective hours of gameplay, I had zero knowledge of the Fallout video game series until I took a game design class at a local community college. One of my classmates played a clip of the first twenty-some minutes of Fallout 3 while pointing out elements that made it a well-designed video game. The notion of playing as a character who lived their entire life in a fallout shelter venturing out into an unknown world in search of a missing parent was enough to intrigue me. I got hooked and wanted to experience more of this world. I’ve since come to learn that I am a lot more cautious and patient than most players. I spent the majority of my time trying to go unseen by the game’s dangerous monsters, robots and humans while wandering through this post-apocalyptic wasteland. And sometimes, what I would find more frightening than some of the mutated creatures were the glitches that seemed to pop up unexpectedly. After much thought, I decided to put together a list of 10 of the most jarring or bizarre things I encountered from Fallout 3 and Fallout: New Vegas. I knew from my classmate’s demonstration that one set of creatures I could expect to encounter would be giant black ants. I ran into some early on in my gameplay and didn’t find them all that difficult to kill. A few good hits with a melee weapon–my general favorite at the time–made short work of them. Then I acquired a quest to clear a town of giant fire ants. The first one I saw upon reaching this town was red instead of black. I didn’t see any other difference until it got close. Before I knew it, my entire screen and vision was filled with flames that the fire ant was spewing at me. 2) Think I just had a heart attack! All enemy units appear as a red blip on the radar, but you can only see the blips present in whatever direction you’re facing. That being said, I was crouched and sneaking through a wide, open area with the computer’s volume off when the word “Danger” flashed on the screen. This means that something is moving in to attack. I could only see one blip on my radar. Since I was playing without any sound and unable to hear anything coming, I watched intently for several seconds to try and see what was approaching me. When I failed to spot anything, I turned around…and a molerat’s face filled the entire screen with its mouth open. 3) Do I have to fight this thing? I had exercised so much caution during my first play-through of Fallout 3–even sometimes taking detours to avoid a fight–that I didn’t see or even know about the game’s most dangerous creature until very late in the main questline. I was trying to escape from an underground facility known as Raven Rock when I came upon this large crate at the top of a staircase. I used a nearby computer terminal to open the crate and watched in terror as this demonic-looking creature with long sharp talons stepped out. Fortunately, it didn’t see me and it moved away to attack the enemy units further down the hallway. It took me three to four minutes of sitting by the crate before I worked up the courage to move. 4) The mother of bad ideas…. One of the side quests for Fallout 3 entails retrieving an important document being guarded by a dangerous cyborg inside a small office. I didn’t have the skill set needed to persuade him to hand over the document without a fight. After several rounds of trying and failing to beat this cyborg, I got frustrated enough to try an alternate–and very stupid–tactic. In a nutshell, firing a mini-nuke launcher in a small, enclosed space is effective at both killing and committing suicide. 5) This area is totally f***ed! There is a location in Fallout: New Vegas called Black Mountain where so many odd things occur that I call it Game Glitch Central. Repeat occurrences of seeing monsters literally appear out of thin air right next to me, my character being randomly thrown back down to the base of the mountain path, and game crashes, among other problems, eventually made this an area to avoid at all costs, for me at least. 6) Can’t we talk this over? When I first started playing Fallout 3, it was on a laptop with a mouse touchpad. The touchpad was highly sensitive and more than once, the gun I was using would discharge when I least expected it. This really became a problem when I was roaming around one of the friendly wasteland settlements and accidentally shot someone. The next thing I know, I had every single adult inhabitant running at me with guns drawn ready to take me down. Being a gamer who prefers stealth over frontal assaults, I had adopted a unique tactic over time. With a high Sneak skill and decked out in the Chinese Stealth Armor that made me invisible when crouched, I planted land mines in the path of any enemy unit or monster I came across to take them out. This tactic didn’t work as well when several Enclave soldiers made a turn at an intersection before reaching the mine. I maneuvered to get ahead of them undetected and planted another land mine without picking up the first. Once they had been taken out, I was looting the bodies for good stuff to sell when I heard this booming sound behind me. When I turned around, I saw I’d inadvertently killed a merchant who was passing through the same intersection. The first expansion pack for Fallout: New Vegas, called Dead Money, took you to a highly toxic area centered in and around a derelict casino. The overall mission requires the player to access the casino’s vault in search of treasure. For me, it was a very time-consuming and dangerous undertaking. At one point, I had to escape from a radio tower that had half a dozen monsters roaming about outside. This wouldn’t have been a problem if I wasn’t at only one bar of health, had no healing items, and very little ammo; all it would take to kill me would be one or two hits. It took some doing, but somehow I made it out of that situation in one piece. A good thing too, since the last time I had saved was about 50 minutes of gameplay earlier. 9) This is beyond freaky. I don’t know how many players, if any, encountered the unique game glitch that I did in Fallout 3. Strangely, this one only seemed to target a specific creature, the Yao Guai, a mutant black bear. When killed, it would sometimes fall into the ground and then spring back out with a distorted, taffy-like appearance. I sort of wish I had a picture of this effect, but it was always unnerving enough to send me running off in another direction. One of the weirdest glitches I encountered in Fallout 3 was when I approached one of the many mountains and was seeing two red blips on my radar. It’s a good thing I looked up to see the sky, or I would have missed seeing two black shapes launching into the air. My initial, irrational thought was that something was jumping over the mountain to attack me. I looked around wildly until my gaze landed on my A.I. companion; he was holding his gun at a perfect 90 degree angle. I watched him stand in that position for a couple seconds. Then, lowering his gun, he said, “Oh, they got away.” I later found out that there’s a glitch that randomly launches some monsters into the stratosphere. 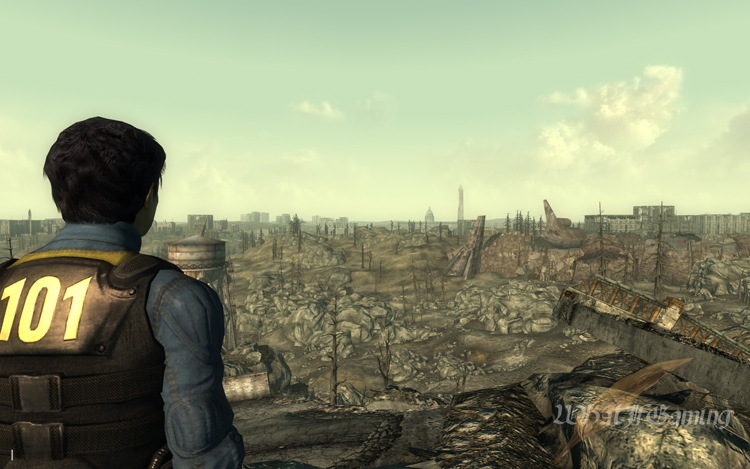 Prior to my hours spent playing Fallout 3, I don’t believe I had ever played an open-world game. I’ve since come to love the idea of exploring a large map to your heart’s content and being given the option to just ignore the main game story indefinitely. Despite how many hours I spent playing and replaying Fallout 3, I don’t think I explored every nook and cranny on the map. The world of Fallout: New Vegas was a smaller scale, but gave the player the option to gamble on slot machines or card tables set it apart from its predecessor. Yet, each game had its flaws. I don’t feel the main story of Fallout 3 was compelling enough to make me want to play it over and over. Fallout: New Vegas does have an interesting plot and gave the player the option to become the ruler of the Casino Strip, but it doesn’t have a big enough map in which to roam around. Even though I may never go back to playing the two previous games, especially after the recently-released Fallout 4 has eclipsed them by far, I can still look back fondly on those moments that made 3 and New Vegas a particularly memorable experience for me. You made the game come alive. This is very amusing and fun to read. The husband plays Fallout, so I know a little bit about the game. It’s one of his favorites. Your piece was funny and made me laugh, probably because I usually would hear the husband firing weapons or my kids yelling at the screen telling him not to go somewhere. Jeanette, I’m not drawn to video games, but because of your post, I can see the allure they have. The player becomes part of the story and later walks away with memories unique to their time in play. Have you thought about lending your writing skills to video game programers? Great post, Jeanette. My teenagers play this game. I bought Fallout 3 for them which they say is more story. They downloaded Fallout 4 from Steam for the combat aspect. What will you review next?